When a diamond worth millions is stolen from the small mining town of Kimberley, South Africa, Inspector Lipinzki (Barry Keegan) is quickly on the trail. The security, organised by Mr Arundel (Patrick Barr), was impressive – so how was it stolen? 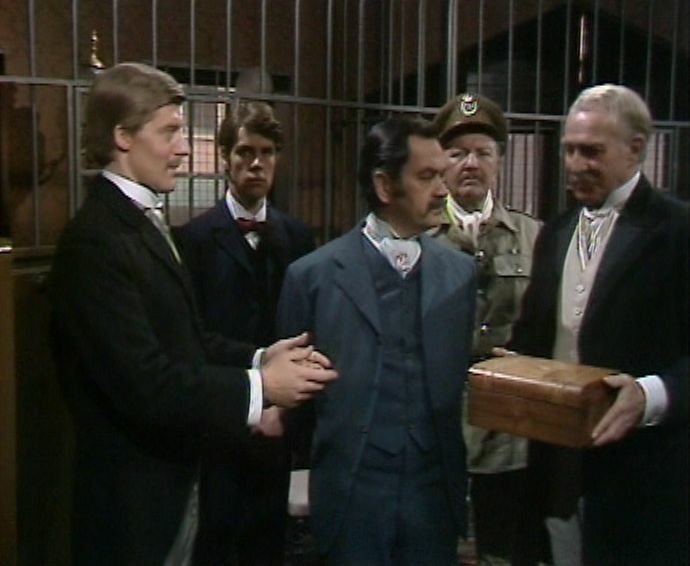 But even if he doesn’t know how, the dogged Inspector is convinced he knows who – Philip Marsden (Martin Jarvis). Marsden, along with his colleague Charlie Lomas (Richard Morant) were tasked with guarding the diamond and therefore both must be considered prime suspects. But Marsden is a powerful man and Lipinzki will have to tread carefully, otherwise he may find himself out of a job. Five Hundred Carats was written by George Griffith and was originally published in 1893. It can be read here. The second series of The Rivals saw a greater international cast of detectives and this story, set in South Africa, is the first example. But despite the foreign setting it’s still very much a studio bound production (although there is some location work later on – with a sandpit doubling for the South African outback). Barry Keegan gives Lipinzki a lovely world-weary air. Unlike some of the other detectives featured in the series, he’s not analytical or given to flights of fancy – Lipinzki is just a hard-working, methodical policeman who uncovers the truth by effectively waging a war of nerves with his suspects. And after suffering a brief moment of doubt when he realises he’s no idea how the robbery occurred, the Inspector is on much firmer ground once he’s found a suspect he can pressurise. He admits he doesn’t possess any evidence but he’s prepared to press Marsden hard and see what happens. This isn’t easy though, since Marsden is a gentleman and Lipinzki isn’t. The point is brought up early on after the affable Arundel mentions to Marsden that he’s been politely asked not to invite the Inspector to the club quite so often. It’s a sentiment that Marsden agrees with (he views Lipinzki as being uncouth in the extreme) but Arundel is a great respecter of the Inspector’s abilities and isn’t concerned with issues of class. But Marsden is and he wastes no time in letting Lipinzki know exactly how little he thinks of him. The confrontation between Keegan (softly-spoken Irish) and Jarvis (upper-cut English) is one of the highlights of the episode. And although Marsden is a character whose actions and dialogue verge on the melodramatic at times, Jarvis is a good enough actor to still make him a believable and rounded figure. Richard Morant is effective as Lomas, whilst Aideen O’Kelly takes the only main female role as Bridie Sullavan. Bridie is a widower who runs the local bar and finds herself an object of attention from both Lomas and Marsden. She views Lomas with the indulgence of an elder sister but has little time for the icy-cold and superior Marsden. Patrick Barr, always such a dependable actor, doesn’t have a terribly interesting part as the upright, honest Arundel, but manages to make him watchable anyway. Another very good character actor, Alan Tilvern, has a more meaty role as Mr Cornelius. Cornelius is visiting from America and is most interested in both the diamond and Arundel’s security procedures. This makes him a suspect (and Tilvern specialised in playing shifty characters anyway) but Cornelius turns out to be nothing more than a diverting red-herring. There’s also a murder (it occurs in the pre-credits sequence although events then flashback so it doesn’t actually happen until towards the end of the story) Another death occurs shortly afterwards and this does tend to reinforce the point that diamonds might be beautiful but they’re also deadly. Although the culprit is caught, the exact place where he buried the diamond isn’t known. Lipinzki isn’t concerned, as the diamond is back in the soil of South Africa – where it should be. Apart from some slightly over-melodramatic incidental music this is an effective episode. The battle between Keegan and Jarvis is excellently done and this ensures that the pace never flags.